Cerullo presents the universal replacement sport bench seat that looks incredible and feels even better. 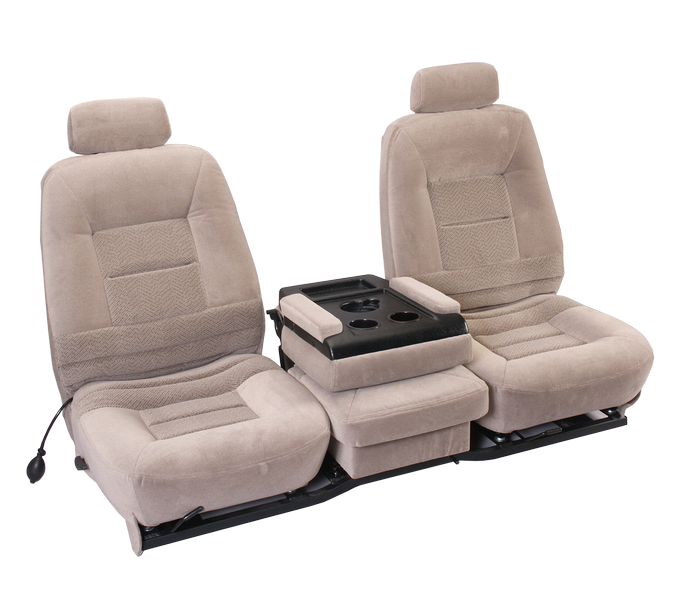 Every truck seat features the individual triple seat design. Separate recliners and seat tracks allow independent movement of each bucket seat which features a recline/fold forward backrest. The spring formed lumbar is designed to automatically fit your back. The center console adjusts forward and back. Console comes with blackABS plastic tray with drink holders which lifts up and locks to form a jump seat. Convenient storage is under the console seat. Available in fabric, vinyl, leather or customer supplied materials and can be made in solid colors or two-tone colors of your choice.